Now go back to your original canvas. 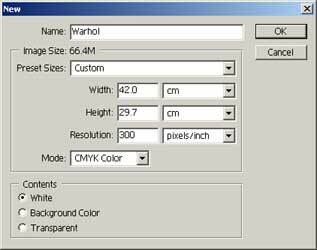 Click on your “photo” layer and drag and drop it onto you new “Warhol” canvas. Put the “photo” layer into a set. 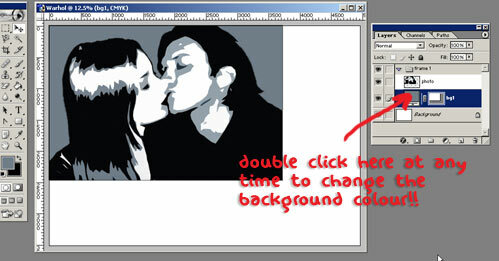 To create a new set, simply click this icon ( ) at the bottom of the layers window. Place the layer into a set by click dragging them onto the set. Rename the set appropiately e.g “frame 1”. 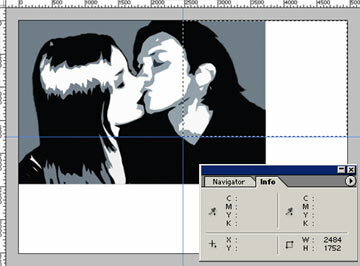 Your layers window should now look like the image shown below. 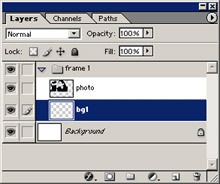 Create a new layer and rename e.g “bg1”. 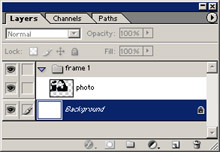 Make sure it is in the “frame 1” set and below the “photo” layer. See the following image. 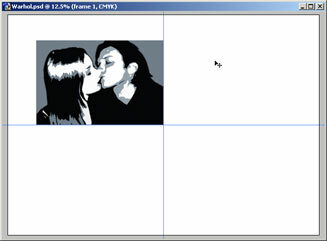 Working on the “bg1” layer take the Rectangle Tool …not to be confused with the marquee tool…this tool is grouped with the custom shape tool. Shft + U ( ) and drag a rectangle to the size of the “photo” layer. Make sure the mode is set to Shape Layers before you draw the rectangle!!!! See image below. The image below shows you how your work area should look now. Don’t worry about the size of the “photo” and “bg1” layers, we are about to adjust that. Make sure your Rulers are on (Ctrl + R), and drag two guides to divide up the canvas into 4 sections. Take your time and get it exact. See below. *TIP: Make sure SNAP TO GUIDES is on and use the rectangular marquee with the INFO WINDOW to measure distances. Now click on your “frame 1 ” set in your layers window. We are going to transform the two layers of this set. Hold down Shft as you scale down so that pic maintains it’s correct proportions. You want to achieve something like the picture below. See how the bottom-right corner rests in the centre of the canvas. Press Enter to complete the scaling. Right click on the “frame 1” set and select Duplicate Layer Set…. Do this 2 more times so you have a total of 4 sets. Rename all your sets to “frame 2”, “frame 3”, and “frame 4”. Now move all the sets into the right positions. If you hold down Shft as you drag the sets, it contrains the movement to only vertical or horizontal…very handy! Right so now your work area should look like the image above. Almost there! 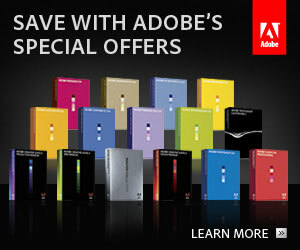 Actually now might be a good time to remind you to Save. Use the move tool and the keyboard arrow keys to move the sets apart a little and get the composition just right.